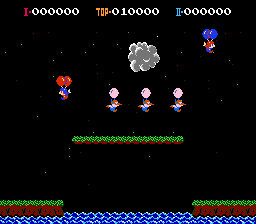 Balloon Fight is an action game for the Nintendo Entertainment System. This is an arcade style game that feautures three game modes. Game A is the main game where the player controls a character with a pair of balloons attached to him. The player is able to fly through the air by rapidly tapping A or holding down B. Hitting the birds’ balloons is the objective of the player. When a bird’s balloon is popped, it floats to the ground where it will attempt to refill a new balloon. At this time, the player must knock the bird into the water. Once all of the birds have been defeated, the player moves on to the next level. When a bird or other obstacle hits the player from above, one of the player’s balloons pop. If both of the player’s balloons are popped, the player loses a life. Game B is a two-player version of Game A. Game C is called Balloon Trip. In this game, the player flies through the sky avoiding enemies and obstacles. Getting hit by anything will end the game. 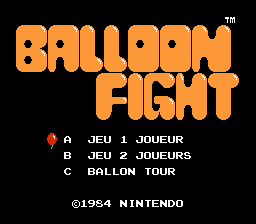 A full translation of “Balloon Fight” for NES in French.